Our Habilitation Specialist can undertake an ‘Environmental Audit’ within educational settings. As part of this process information and practical advice is given to make the school environment less confusing and more accessible to students, staff and visitors who have a visual impairment. Additionally, for the students, physical adaptations can assist in; promoting inclusion, independent travel and making their surroundings safer. 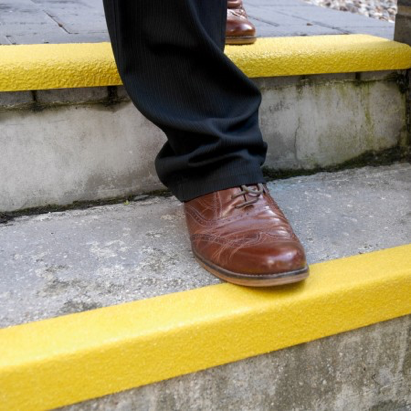 Recommendations may include painting the edge of steps and stairs in a strong contrasting colour to the background. Doing so will assist some people with a visual impairment to negotiate each step more safely and assist with depth perception. As most visually impaired people have some useful vision, colour contrast is commonly referred to in the audit, which will help them to separate the foreground from the background, assist with orientation and avoid obstacles. Consideration will also be given to areas such as: signage, lighting, storage and outdoor areas (playground).